Important tips : If preffered use the pressure cooker to cook the oxtail to reduce the cooking time. Discard the used water after oxtails have been boiled, never think a twice to reserve it for stock. Experience told me those used water always containt too much fat and smell pretty badly. Pour in 2 liter water in a deep saucepan. Add salt, garlic, ginger and pepper. Cover the pan and bring to boil. 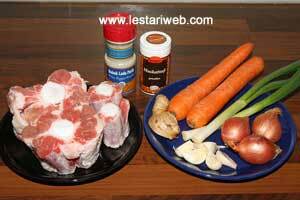 * Add the oxtail and cook on medium heat until the oxtail is well cooked and the meat becomes tender. If preferred you can use press-cooked cooker and boil for 30 minutes since the cooker begins to sizzles. Take the oxtail and set aside to drain. Discard the used water. Grind all ingredients for the spice paste with grinding stone or food processor until smooth. Heat 2 tbsp oil in a frying pan, stir-fry the paste all the time until well cooked & fragrant. Put aside. ** Heat 1.5 lt beef stock or water in a deep saucepan and bring to boil. Add the stir-fried paste. Lower the heat into medium. Add the carrot and potato and simmer until the vegetable well cooked. Add the pepper, nutmeg, cloves and salt. Adjust the seasoning. Add the spring onion and sliced tomato. Remove from heat immediately to prevent overcooked vegetables. Frying the Oxtail: Heat enough oil in a frying pan or deep fryer and fry the oxtail until golden brown. Set aside to drain. Serve the soup with fried oxtail while hot separately and garnish with celery and fried shallot. * Add the meat into boiled water then cook on the medium heat to preserve it's best taste. ** If possible use the beef stock instead of water to make the soup to obtain the best taste.